The hottest deep-space destination of the moment is undoubtedly Mars. We're counting down the days until humans set foot on the Red Planet, but that date may not exactly be right around the corner. Fear not, Mars lovers; NASA has another option for getting people to Martian soil much quicker. But we're not talking about astronauts — we're lookin' at you. In 2014, NASA premiered its Frequent Flyer program. Now, it's not quite what it sounds like; the space agency isn't giving out free miles for rocket travel like some credit card perk. For the program's kick-off, NASA put out a call to the public to submit their names. They then compiled the list of names to etch onto a tiny microchip that hitched a ride on the Orion spacecraft test flight. About 1.3 million names rode up with Orion, the vehicle that will eventually take humans back into deep space. Quite the class of astronauts! 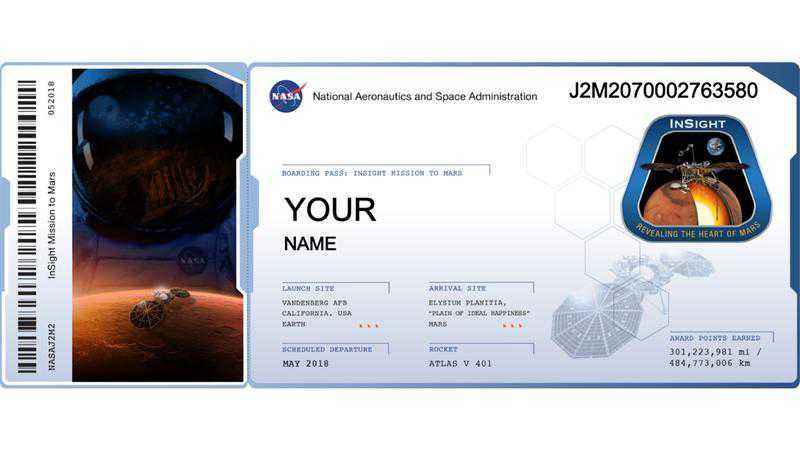 Those who entered their email address automatically signed up for frequent flyer miles, which means that NASA will shoot them an email when another opportunity to put their name in space comes along. After submitting your name and email address, you'll also receive a mock boarding pass that you can share around social media. Trust us when we say it's super cute. FOMO, right? Though you missed your chance to get on board the first test of Orion, there are more chances to get up into space without leaving your couch. NASA plans to send the InSight lander to Mars in 2018, but not without two microchips full of symbolic passengers. You still have time to jump aboard! NASA is accepting names until November 1, 2017 for the 2018 launch. Click here to include your name on this mission. After submitting your name and grabbing your virtual boarding pass, you can check out this world map to see where your fellow passengers live. Unlike the Orion test flight, InSight is actually going to break ground on Mars. That's right — we're all going to Mars, ya'll! But remember, this ain't no vacation. We've got science to do. According to NASA, "InSight (Interior Exploration using Seismic Investigations, Geodesy and Heat Transport) is a NASA Discovery Program mission that will place a single geophysical lander on Mars to study its deep interior." InSight is on a mission to answer one of science's most fundamental questions: How did the terrestrial planets form? And if you want to know the kind of landscape your name will be rolling around on, there's a virtual reality app that can let you roam the red sands at your leisure. We recommend saying hello to the Curiosity rover. It's lonely.